The Starlite Sisters celebrate Singin' & Swingin' Sisters from the Golden Age of Hollywood! Step back in time with these vivacious vintage vocalists as they bring jazz from the 30's 40's & 50's with all the pizzazz of the era! 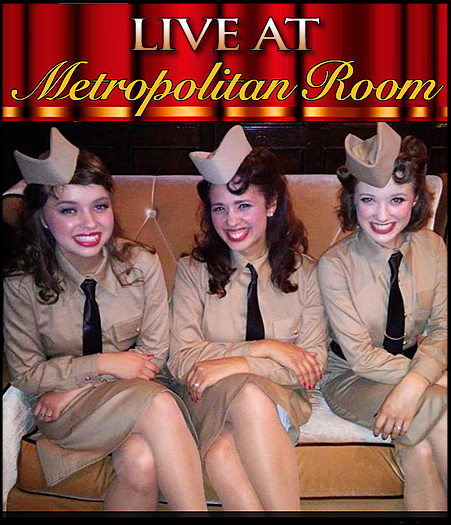 The Starlite Sisters return to the Metropolitan Room with their own special blend of close harmony. Discovered by veteran voice actor Will Ryan and his pal Johnny Crawford (TV's The Rifleman), the sister act has been wowing audiences in the Los Angeles vintage jazz scene for the past 4 years. Watch them here at the 2017 Art Director's Guild Awards in Hollywood!